All these filters Iv3 FLAT line are designed to work different materials from wood to plastic, from aluminum to Plexiglass, Alucobond and Dibond. The lifting device is used for emptying the 100 Lt (iV2 model) or the 160 Lt (iV3 model) chip container with the use of a forklift. The operators do not have to make any effort for the emptying process. At the sides of the collecting containers there are two hooks for the lifting kit to be connected to, which in turn is lifted from the truck by a chain. Strongly recommended whenever possible, the pre-filter is positioned between the vacuum and the chip-generating machine, as the first point of collection of the collected material. It is specially used to preserve the life of the filter inside the vacuum unit. It retains most of the collected material and can have a cone or cylindric shape and serves as a mechanical filter. Through a tangential entry the collected material is centrifuged into its interior until its speed gradually decreases and the material gradually falls to the bottom of the collecting unit due to the force of gravity. 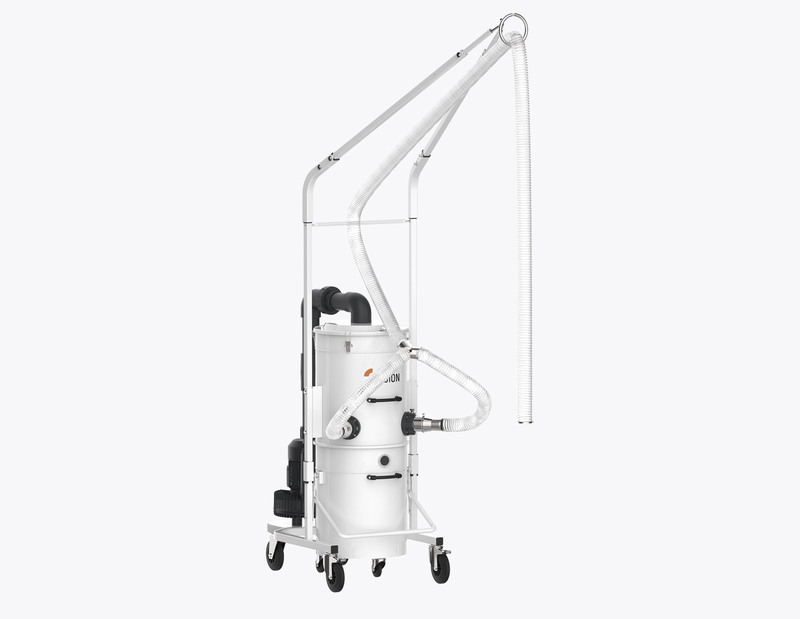 Such a process ensures that only a relatively low percentage of collected dust or chips manages to actually reach the real filter positioned in the upper part of the vacuum cleaner. The cyclonic pre-filter becomes almost mandatory for fine or very fine powders, which are very likely to clog the filter quickly, compromising the smooth operation of the entire system, but are only recommended for large, heavy chips. The main advantage of the cyclonic pre-filter is to protect the filter of the vacuum cleaner from quickly clogging, thus extending its life before replacement and significantly reducing the maintenance of the entire system.